With alternative schools much in the news as the Senate continues considering charter-school advocate Betsy DeVos as President Trump's choice for Secretary of Education, a new study of South Carolina charters examined how many of its charters were "beating the odds." A study team made up of researchers from Florida State University and the American Institutes for Research worked with the South Carolina Department of Education to explore what school characteristics could be associated with schools where students do better than expected on the state's learning standards. The idea was to begin gathering data to help state leaders decide whether to expand the charter school option. The study found that 26 to 42 percent of South Carolina's charter schools were "beating the odds" in 2013-2014. Source: "Identifying South Carolina charter schools that are "beating the odds". The project used data covering grades 3 through 8 from the 2012-13 and 2013-14 school years in 38 charter schools. Among the variables were student scores on assessments in math and English language arts as well as the percentage of students who were black, white, English language learners, and eligible for the federal school lunch program or special education services. During the 2013-14 school year, charters in the state had a 3.2 percent share of total student enrollment, according to the National Center for Education Statistics. A charter school was identified as beating the odds if it performed better than expected on the state's Palmetto Assessment of State Standards (SCPASS) in the 2013-14 school year based on the demographic characteristics of the students being served. Of the 33 charter schools serving students in any of grades 3 through 5, 39 percent were found to be beating the odds in both math and English language arts. 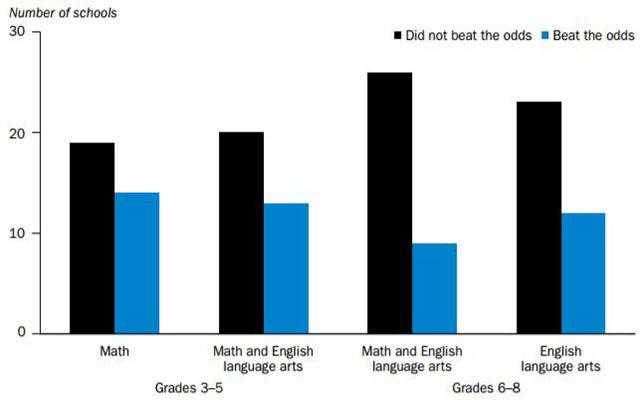 One additional school beat the odds in math only. Of the 35 schools serving students in any of grades 6 through 8, 26 percent beat the odds in both subjects. Three additional schools did better specifically in ELA alone. The researchers noted that the study had limitations (such as the relatively small number of charters in the state, which limits the precision of the overall analysis). However, the hope for the study was that it would help the state identify "promising practices" or other success factors that could be shared in and out of the state. Next up, a leadership project to figure out whether the "beating-the-odds" charters "engage in unique practices associated with school success." A report on the results is available on the website for the Institute of Education Sciences National Center for Education Evaluation and Regional Assistance.